He received his master degree in Biology from the University of Sevilla in 2001 and carried out my PhD (2003-2008) at the “Institute of parasitology and biomedicine Lopez-Neyra (CSIC)” in Granada where he studied epigenetics and nuclear architecture in eukaryotes. In his postdoctoral studies (2008-2014) at the “Clinical Science Centre (Medical Research Council/Imperial College)” in London he worked on the function of chromatin factors in the regulation of stem cells and nuclear reprogramming. 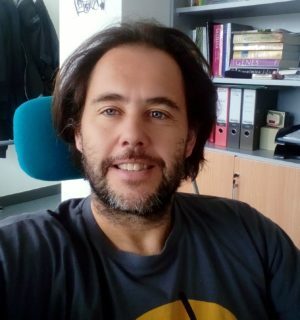 In 2014 he was awarded a “Ramon y Cajal” (RyC) tenure track grant to join the “Department of Biochemistry and Molecular Biology II” at the University of Granada (UGR). Since then, he is head of the “Epigenetics in Stem Cells and Cancer Lab” at the “Centre for Genomics and Oncological research GENYO (funded by University of Granada, Junta de Andalucia and Pfizer)” in Granada. David is currently leading his own research group, obtained competitive funding for several research projects and has published his work in some of the best biomedical journals in the world. Propuesta de Resolución Provisional de candidatos seleccionados y de reserva de la convocatoria 201 6 de l as ayudas Ramón y Cajal del Ministerio de Economía , Industria y Competitividad.